The only trouble was that it was about 110 degrees in the San Gabriel Valley the week I heard about it, as Jonathan Gold noted in his review, which just didn't put me in the mood for dim sum. So we finally convened a small group to eat there, only to find Abby's much larger Pleasant Palate group also sequestered at the rear of the restaurant. It's a large place with a huge parking lot; even though we made reservations, there was no "sweating hordes," as Gold described, waiting at 11 am on a Saturday. Have you ever found a dish you love more than the way it actually tastes?That's how I feel about wolf berry pudding. 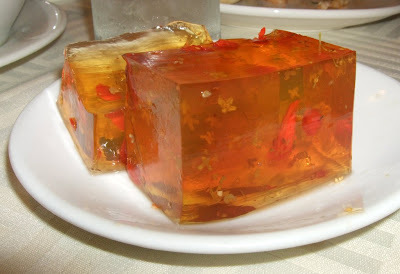 It's got wolf or goji berries, which are healthy, it clears the palate after salty dim sum, and it looks like the inside of a lovely little aquarium. Somehow it doesn't matter that the actual flavor of it is just sort of sweetened clear jello. 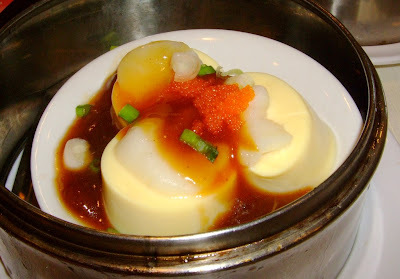 Verdict: Well worth a try if you've exhausted the other dim sum choices or are just looking for a less-crowded place. Also handy if you want to hit Fosselman's, Target or Costco afterwards. "Have you ever found a dish you love more than the way it actually tastes?" For me, it's caramel apples. I love caramel, and applies might be my favorite fruit, so one would think the combo would be magnifico. Hardly, at least not for me. while i LOVE the sound of duck a l'orange, it never tastes good... ditto to soon doo boo. King Hua looks like it's doing "haute" dimsum in the line Elite/Triumphal, but a wee bit more refined? 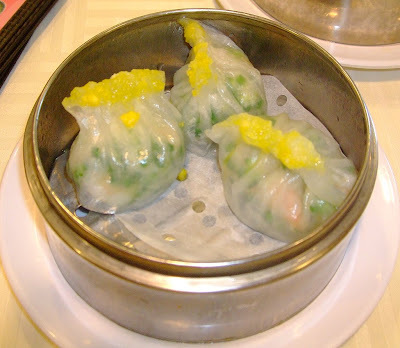 Ooh, a new dim sum place we have to try! Thanks!